Spot the people! This photo (taken from the ‘bottom’) shows the sheer size of some of the rocks. This photo shows the rocky terrain, which was very difficult and required a lot of attention. Nice to turn around every so often and see how far we’d come! Lucca and me feeling triumphant! Who said going down was the easy part?! *I lied. It’s not itsy bitsy at all, it’s enormous. Iztaccíhuatl stands at 5286m above sea level and is Mexico’s third highest peak after Pico de Orizaba (5636m) and Popocatépetl (5452m). Britain’s tallest rock formation Ben Nevis (it’s a mountain, we haven’t had any volcanoes in Great Britain for the last 60 million years) is 1344m high. Mount Etna, Europe’s tallest active volcano, was last measured as 3329m high. Kilimanjaro, Africa’s highest mountain (a dormant volcano), reaches 5895m. Iztaccíhuatl and Popocatépetl (Izta’s next door neighbour) form part of the Pacific ‘Ring of Fire,’ a large series of volcanoes which encircle the Pacific Ocean to form an area notorious for dramatic eruptions and violent earthquakes. The Ring of Fire is shaped like an upside down horse shoe, stretching from New Zealand up the East coast of Asia, and down the West coast of the USA and South America. The most active volcanoes in Mexico are found along the Trans-Mexican Volcanic Belt (known locally as Sierra Nevada), spreading 900km from West to East across central-southern Mexico. Popocatépetl is a particularly feisty one, last erupting on the 11th of July 2013. Iztaccíhuatl, however, is craterless and dormant, and open for exploration. We were dropped off at 3990m and walked/crawled the La Joya route up to just below 5000m. To go any higher requires an overnight stay for acclimatisation. One day was absolutely enough for me! It was hard, really hard: the terrain was steep, rocky and unstable. The altitude wasn’t as much of a problem as I had feared and with regular breaks I managed to scrabble my way up without any major disasters. But after a 45 minute rest at the top spent admiring the incredible views, my legs decided that they’d had enough, and were rather reluctant to get back to work. The descent was a challenge. At times it was like sand-skiing without skis, and our boots required regular tipping. We were trying to go as fast as we could to get it over with, but jelly legs made me feel like a clumsy octopus and it was too treacherous to go too quickly. I’ve never felt exhaustion like it, and it’s the only time I’ve ever really felt like my body was totally at odds with my will. After six and a half hours we were very, very happy to see the base camp. Too tired to be jubilant, only rest and relief occupied my thought stream for the next few hours; I’m not sure if it was the heat or the altitude, but I felt very nauseous for the entire three-hour journey home. It was simultaneously a lot of fun and really awful. More fun than awful, I think, although my thighs are currently telling me otherwise. In a strangely masochistic way, it’s precisely because it was so awful that it was also so much fun?! This is my house. 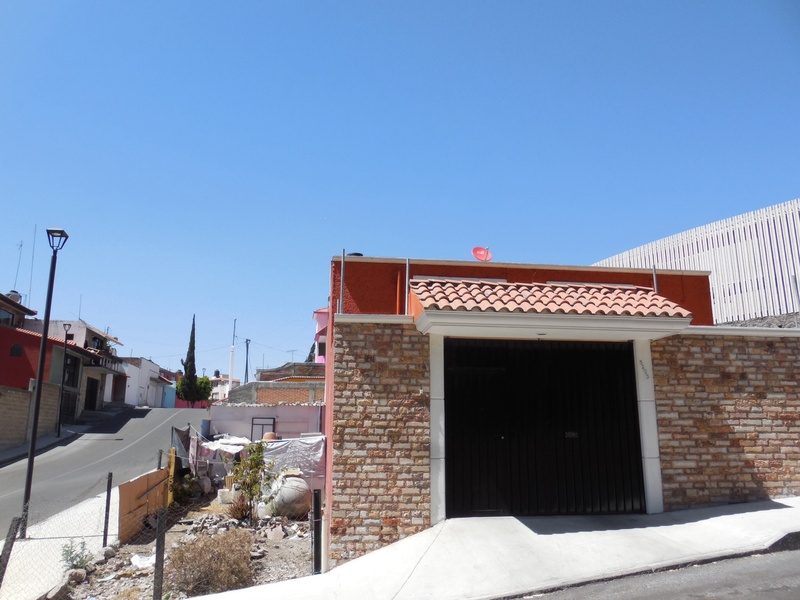 Luckily for me, it’s the one on the right, but the comparison with our next door neighbours serves as a constant reminder of the enormous wealth disparity in Mexico. Behind the enormous black gates there is a small forecourt for three cars, and then the house, which is split into two halves. I live in one side with my host parents, and on the other live my host brother and abuelita (grandma). The security might look substantial, but unfortunately it wasn’t enough to prevent our house from being burgled at the weekend. Despite being a nice neighbourhood in one of Mexico’s more affluent cities, it’s not immune from the regrettable reality of crime here. This is the view just down my road, and it’s a very typical Pueblan vista. Blue sky, check. Multicoloured buildings, check. A scattering of Beetles, check. 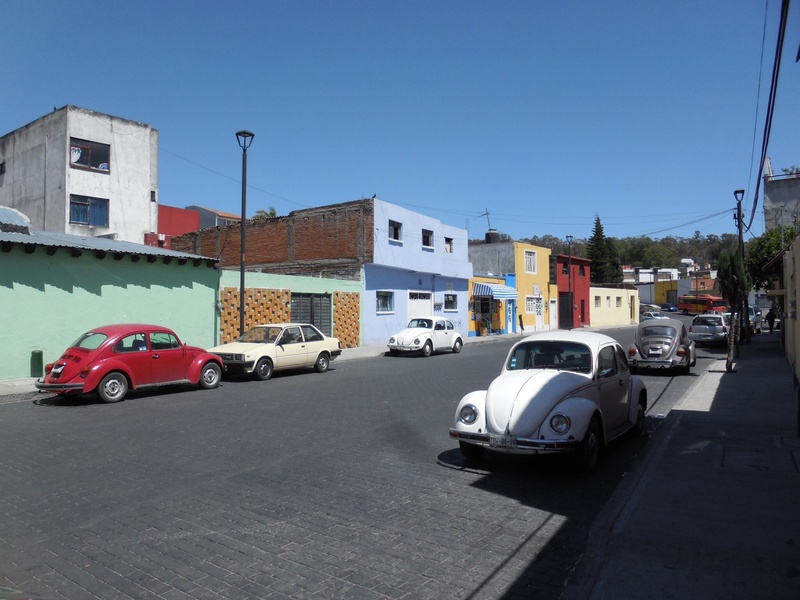 The Volkswagen Beetle has become an icon of Puebla since VW opened a plant in 1965 on a 2-million-square-metre field in the Pueblan suburbs. The first Beetle rolled off the production line in 1967, and the plant made history in 1981 with its 20 millionth. A further 1.15 million units were made in Puebla between 1997 and 2010. Today the plant builds the coupé and cabriolet versions of the Beetle, the new Golf and the VW Jetta. The sight of so many Beetles, more old than new, give the city streets a distinctive rustic charm. Captured from just behind my house, this is the view of the volcanoes Popocatépetl (meaning Smoking Mountain in Nahuatl) on the left and Iztaccíhuatl (meaning White Woman) on the right. 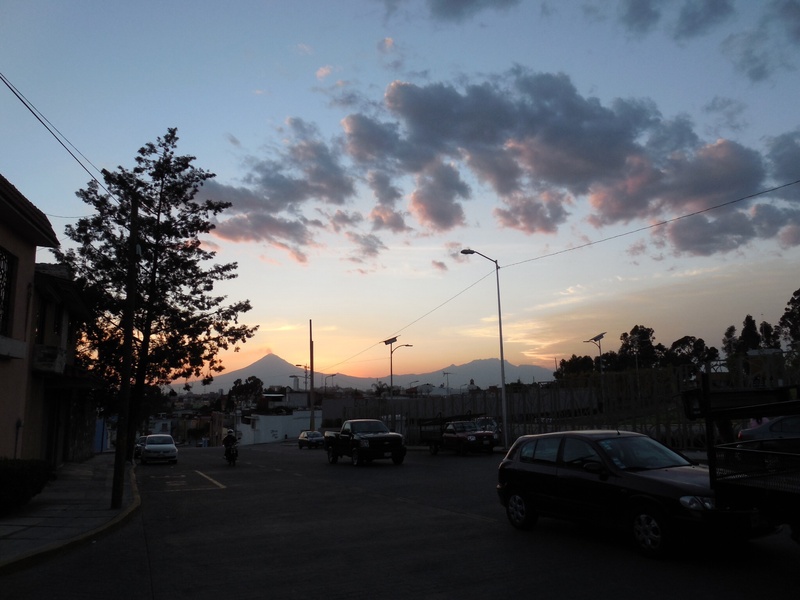 Popo is the second highest peak in Mexico (after Pico de Orizaba), and also Mexico’s most active volcano. Izta is the third highest, but is craterless and dormant. Due to Popo’s temperamental behaviour its summit has been off-limits for the last decade, so I am going to climb Izta in a couple of weeks instead. I love a big volcano! The church of San José, a 10 minute walk from my house. 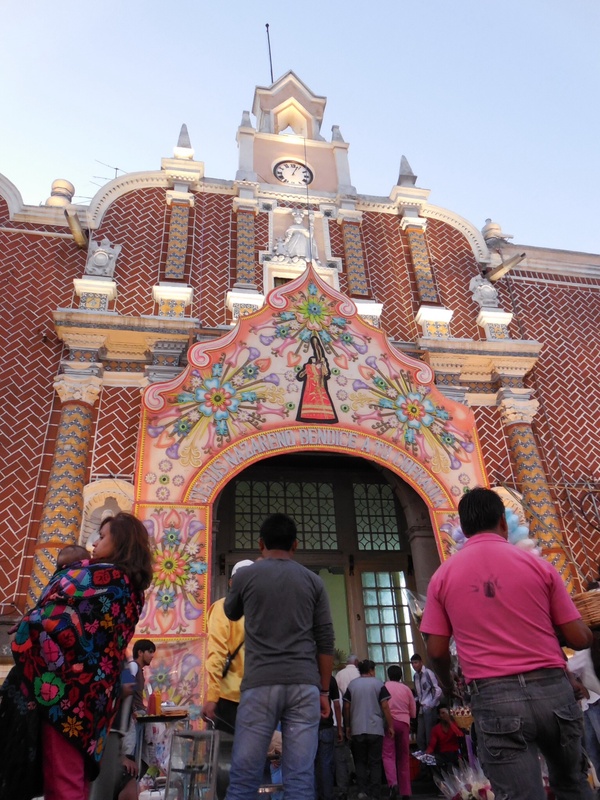 What do you get when you mix a Catholic calendar crammed with Saints’ Days and celebrations and the Mexican taste for all things bright and beautiful? A church façade adorned with giant, colourful foam décor and a bustling market brimming with rides and street food, of course! 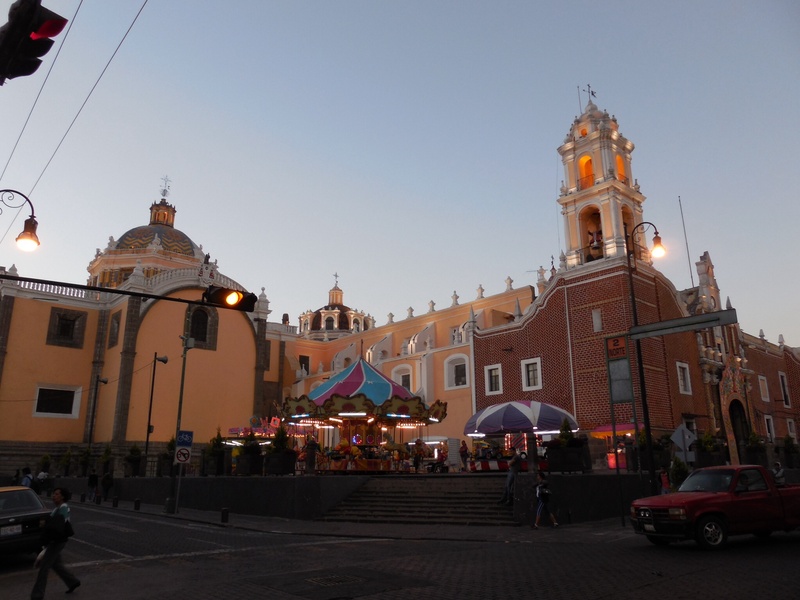 Almost every very week there’s a feria (fair) somewhere in the city, and last week the man of honour was none other than San José (Saint Joseph), Spouse of the Blessed Virgin Mary and step-father of Jesus Christ – quite a biggie! This huge decoration is typical of Mexico’s vibrant colours and patterns; it really embodies the lively, joyful spirit of festivities here. Regardless of the ‘meatless’ custom (wherever that may or may not be), chalupas are the dish of choice for most street party attendees. 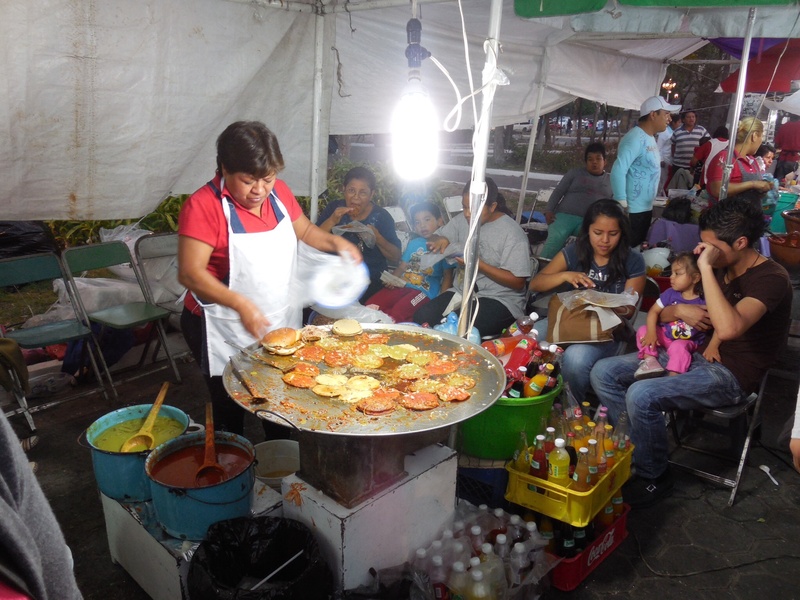 Chalupas are a Pueblan speciality, and when the Poblanos want to eat on the street, it’s most likely to be these greasy little treats they’re looking for. Made from little discs of masa dough, they are fried and topped with either red or green salsa, shredded chicken or pork, and onion. You ask for however many you want and they’re piled high in a big sloppy mess – and served with no cutlery, which just adds to the fun. A delicious dinner for about 50p, you can’t really grumble at that. So that’s a little insight into my life here in the heart of Mexico. With plenty to see, to do and to taste there’s never a dull moment: it’s a crazy place and they pride themselves on exactly that. It’s everything I dreamed of, feared, and so much more – and I wouldn’t change it for the world.